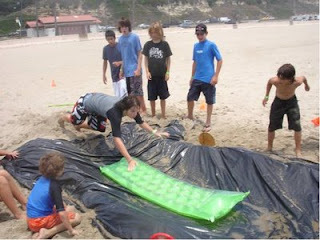 Here's a picture of Aloha Beach Camp's High Action Camp at Zuma Beach, the Cosmic Water Slide. 's how it works. We carve a downgrade in the sand 100 feet in length, then cover it up with plastic and wet it down so it's slippery. With a running start, campers toss an inflatable raft in front themselves and dive on for a wet and wild "ride down the Slide."